Sydney on a Budget. Yes I know that Sydney, one of the most stunning cities on the planet, and the word ‘budget’ don’t exactly go hand in hand. 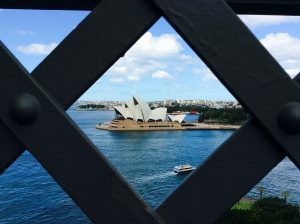 But there are ways to see the sights of this amazing city without spending a fortune, so here’s some of my tricks and tips on ways to save and see the sights of Sydney. Opal is the way to get around Sydney. It’s a free card you pick up at stations, newsagents and convenience shops. Just load it up, ($10 minimum), and you’re good to go. ‘Tap’ in and out on buses, trains and ferries for a quick and easy way to get around. Sunday travel around the city is capped at $2.60 so worth saving your ‘big travel day’ for a Sunday. I reckon some of the best views of Sydney are from the water and there’s no shortage of boat tours and cruises. 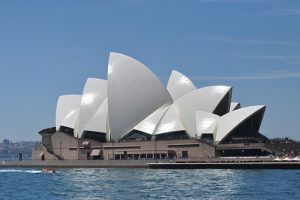 Captain Cook is one of the big operators but for a cheaper but stunning close up of the Opera House and iconic Harbour Bridge, jump on the ferry at Circular Quay to Darling Harbour Costs less than £5 with your Opal card and you’ll be guaranteed some stunning shots. Or catch the Manly ferry from Circular Quay and you’ll go right past the Opera House for close up views. To see the city light up at sunset you could take a trip to the observation deck at Sydney’s tallest building; the Sydney Tower but it’ll cost you around £16. ~So why not head for the Blu Bar in the Shangri La Hotel on Cumberland Street, where for the price of a drink you can bag a window seat for jaw dropping views over the harbour. Climbing the bridge is an amazing experience and I loved every minute but it’s not cheap at around £160 plus, depending on the exchange rate. If money’s tight, (or you don’t have a head for heights), take your snaps from the Sydney Harbour Bridge Pylon Lookout Far fewer steps and costs $15 a time; that’s around £9. Or walk across the bridge for free at street level. 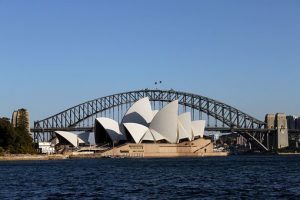 Takes about 20 minutes and the best way is to catch the ferry to Milsons Point Wharf and walk across from the Kirribilli side towards the Opera House and the Rocks. Tours and trips can eat into your budget so head for the Rocks, which is the oldest part of Sydney, and join the free daily walking tour. Tours leave Cadmans Cottage at 6pm every evening and take around 90 minutes. Or for city sights meet at the Town Hall Square at 1030am or 2.30pm. ← Is it ok to offer free gifts with loans and credit cards?